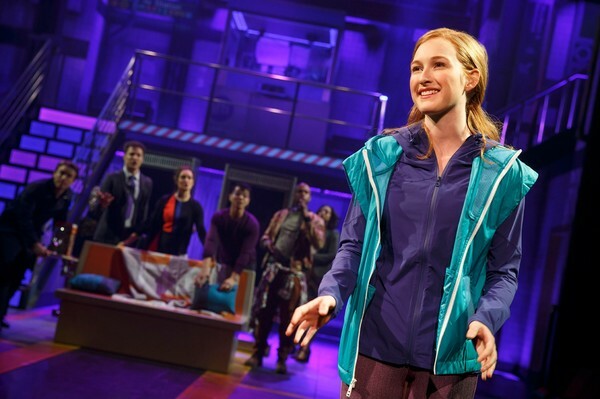 New Broadway musical In Transit is doubly unique, winning points for both its originality and for being an entirely performed a cappella. It is a time of extremes on Broadway. Sunset Boulevard boasts the largest orchestra ever assembled for a Broadway musical, while in In Transit there is not a single instrumentalist to be heard. The musicality of In Transit is, however, in very safe hands, with vocal arrangements by Deke Sharon, who performed the same duties for Pitch Perfect 1 and 2. Working without a source material, the creation of the musical from scratch took a team of four talented composers. 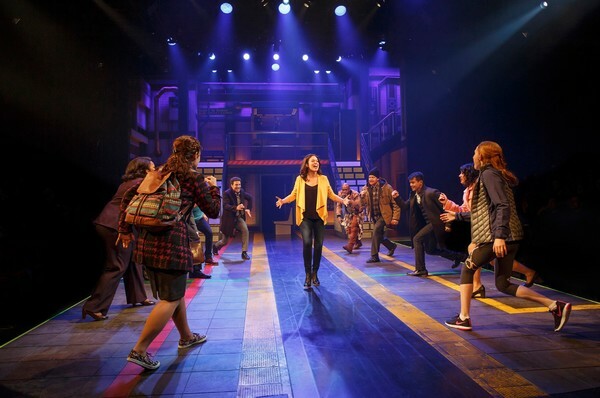 Kristen Anderson-Lopez (of Frozen fame), James-Allen Ford, Russ Kaplan and Sara Wordsworth are each credited with writing the book, music and lyrics for In Transit, giving the musical a slick integration of story and songs. 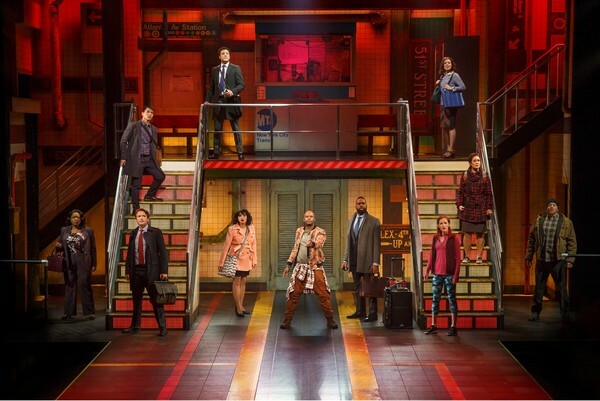 Ostensibly a comedy about riding the subway in New York, the show is more substantial than the vibe that this concept suggests. The subway is a microcosm of society, and with statistics suggesting that New Yorkers spend a full month of each year in transit, it makes sense that a decent slice of life takes place on the subway. Award winning director/choreographer Kathleen Marshall makes the whole show dance in a surging, pulsing flow of constant movement. Marshall matches the variety in the music with a range of choreographic styles. 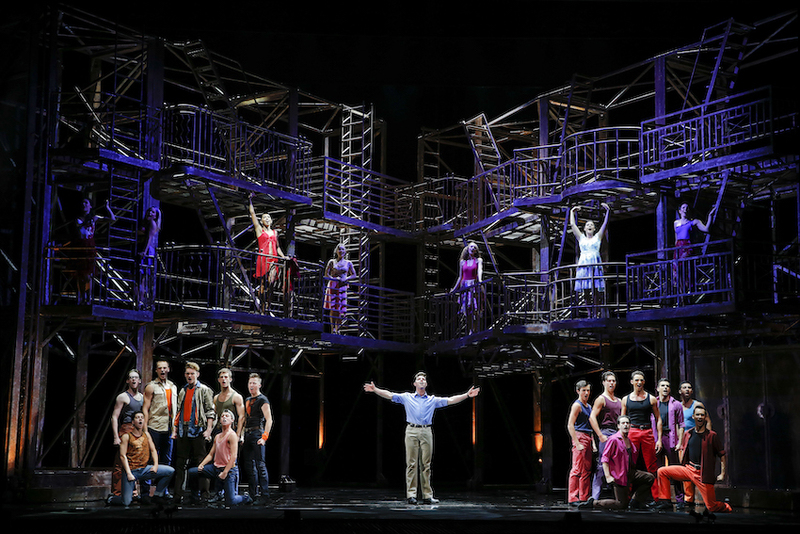 The almost nonstop singing/acting/dancing from the company of eleven is extraordinary, much as they all make it look quite effortless. Donyale Wherle’s scenic design features a hyper-realistic subway station, albeit one with many more embedded lights that the real thing. 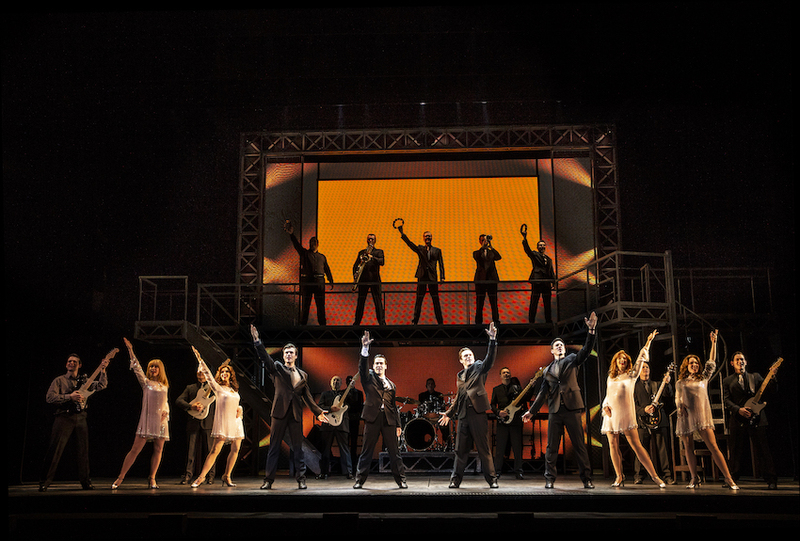 Great use is made of a central travelator, which not only delivers cast and props but also simulates the range of motion that is central to the concept of the show. No place for divas, the lead cast each has their time in the spotlight but also performs ongoing backup vocals for each other’s scenes. Chesney Snow gives an incredible lead performance as subway station performance artist Boxman, contributing an amazing percussive accompaniment to the songs. Telly Leung and Justin Guarini achieve sugar-free sweetness as engaged couple Steven and Trent. Free to legally marry, they still face constraints from Trent’s Christian Texan Momma. Trent’s client Jane flies from her to temp job to auditions clings to her dream of a Broadway career. Jane’s insecurities are amplified when Nate appears to have given her a fake phone number, but his money woes are really the root of the misunderstanding. Margo Siebert and James Snyder play these roles with a neat balance of freshness and weariness, demonstrating that Broadway protagonists can be adults not just starry-eyed kids. Despite having the requisite fitness for the marathon aspect, Erin Mackey brings out the almost crippling insecurities of Ali, sister of Nate, who still pines for her ex-partner Dave. Moya Angela creates a range of distinct characters, jumping from icy Momma to Jane’s kindly boss Ms Williams to weary station attendant Althea. Angela brings warmth to each role, and sings with stirring power. 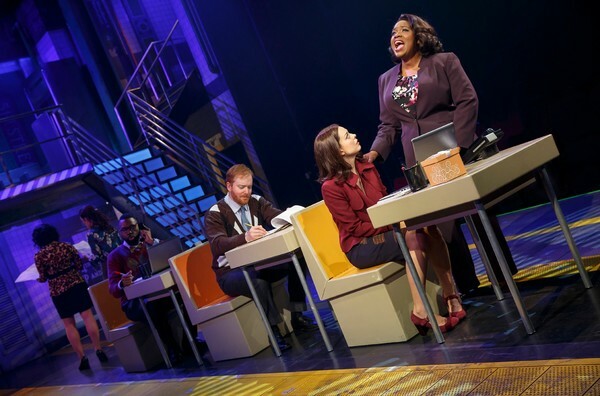 Although In Transit borders on being an off-Broadway show at Broadway prices, it is an engaging, accessible musical. The 100 minutes of the one-act show fly by at the pace of an express subway train at a local stop. In Transit was reviewed 3pm Sunday 2 April 2017 at Circle in the Square, New York.